Big savings. That's the promise of factory rebates and incentives. Our Payment Wizard will show you exactly how much you can save on your new 2019 Toyota Highlander whether you get cash back, a low APR loan or a lease. 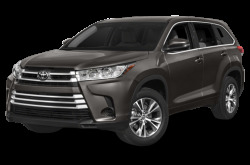 Just select the style and particular incentive for your 2019 Toyota Highlander — and we'll show you how much you can save. Want the "Out the Door" price from a dealer? Knowing available rebates and incentives is only the first step to savings. Don't use MSRP as your starting point for negotiations — request a dealer's Internet price so you can learn the true "out the door" price of your new car. You have chosen to receive IncentiveAlerts on this model for the next six months. If you&apos;re interested, you can choose IncentiveAlerts for additional models. Reduced-rate loans are offered by car makers to qualified buyers for specific vehicles. Rates tend to be lower for shorter payoff periods and not every buyer will qualify. Check with your local dealer for all the details. The major car companies sometimes offer special promotional lease rates. Not every buyer will qualify for these lease rates so make sure to check with your local dealer for all the details. Sometimes particular groups, such as college graduates or the military, are allowed to buy a car for a special discounted rate. Eligibility for these incentives varies. Contact your local dealer for all the details. After 6 months we'll automatically remove your info from our database unless you unsubscribe earlier. If you use Earthlink's spamBlocker or SpamArrest, you may not receive our emails, as our systems are automated. Please add carquote@email.newcars.com and donotreply@newcars.com to your approved senders list or be sure to check your Unverified Messages folder. Hint: Rebates & Incentives are the first step. But you may save even more by getting price quotes over the internet. Getting car quotes emailed to you is way less hassle and puts you in control. Saved... For the next 6 months, we'll send you an email when new rebates or incentives are announced for the 2019 Toyota Highlander. In the meantime, you can see other vehicle rebate information by selecting an option below.